The topic is approached from a variety of disciplinary perspectives, including historical insights into the expansion of the trade, ethical considerations of charity clothing practices, and economic analysis of how value is added to clothes and profitable relationships maintained. The contributors analyse specific localized practices and, crucially, place these within the broader context of global networks and markets. 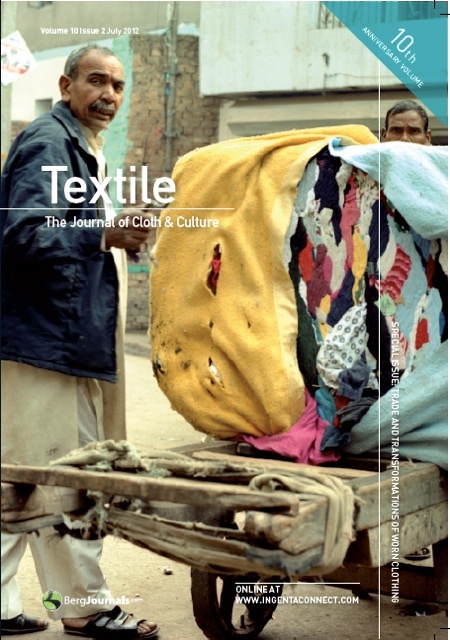 Contributors include Beverly Lemire, Julie Botticelli, Olumide Abimbola, B. Lynne Milgram, Andrew Brooks, Nick Morley and Katie Ryder and my introduction ‘Trade and Transformations of Secondhand Clothing: Introduction’ by Lucy Norris, has been made freely available online (see ‘table of contents’ on the above link). The edition also includes a review by Emma Tarlo of the end-of-project exhibition Everything Must Go, held at the Southbank, London in January 2012 and curated by myself and Clare Patey. We hope you enjoy the issue, and do please get in touch if you have any comments.